VIN News – Irvington, NJ – The days were of nondescript Shabbos and Chanukah candles are long gone and no one could be happier than Yossi Lauber, Vice President of Ner Mitzvah, the Irvington, New Jersey based company that is about to celebrate its 50th birthday. 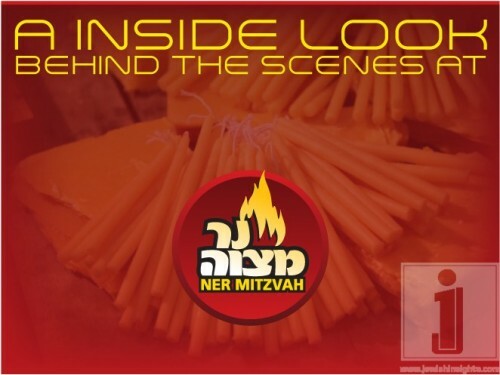 What began as a small family business selling beeswax havdala candles and bedikas chometz kits has evolved into a major operation that sells not only a staggering number of candles for both Shabbos and Pesach but a full line of Pesach products as well. Lauber recalls the earliest days of Ner Mitzvah. Havdala candles were made by hand and instead of selling them in stores, the candles were mailed out with a card, asking the recipient to send payment back to Ner Mitzvah. While Ner Mitzvah still makes their candles by hand, the simple beeswax candles of 1961 have been joined by elaborate, hand carved paraffin candles, which are literally works of art. Another of Ner Mitvah’s early products was bedikas chometz kits. Today Ner Mitzvah offers a staggering number of choices. Chanukah candles, which once came in an anemic assortment of washed out colors, now burst with color as Ner Mitzvah offers gold candles, metallic candles, blue and white candles, decorated candles and even a musical Chanukah candle. Ner Mitzvah’s revolutionary jelled olive oil Chanukah Lights, individual inserts that are ready to light, make quick work of Chanukah candle lighting, it actually takes eight separate factories to produce and package all the components of this product. While their name suggests that Ner Mitzvah is only in the candle business, they also produce several innovative products designed to make koshering your kitchen for Pesach easier and safer. They are also improving last year’s sold out matza stand, a table designed to hold a box of hand shmura matza on top, with one shelf for hagadas and another for wine underneath, by adding a towel rack on one side and a hook for a shtreimel or a hat on the other. For the first time Ner Mitzvah provides an inside look to its operation In an exclusive interview for VIN News, Yossi Zweig takes a tour of the Ner Mitzvah factory in New Square, New York and visits Ner Mitzvah’s New Jersey headquarters for a fascinating behind the scenes look at the company’s operations.